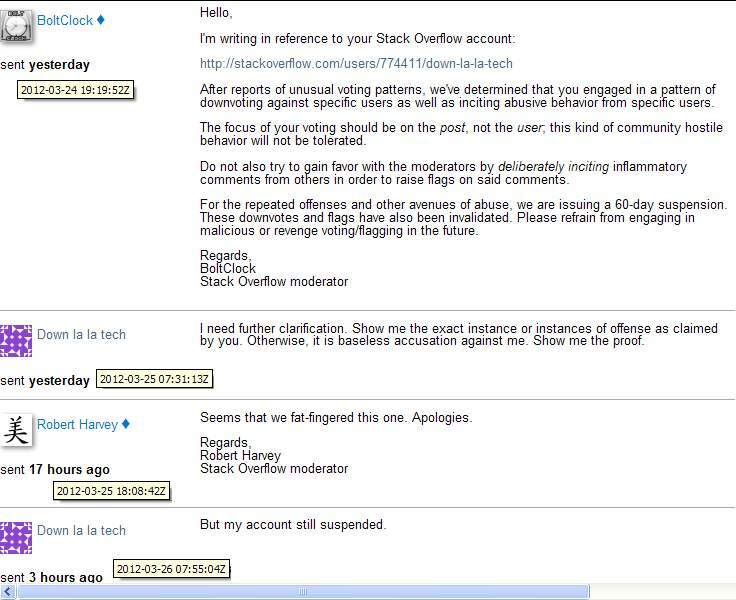 I have a David vs Goliath case here involving a teen moderator on Stack Overflow. His display name is BoltClock. Now back to our discussion. How come a moderator can suspend a user without any proof of wrongdoing? Could it be that BoltClock's lack of experience or young age is the factor for his mistake? What is the lesson from this mistake? Do we need to introduce a minimum age requirement for any future moderator on the SE network? Splitting hairs, but BoltClock isn't a teenager. According to his profile he's 20. Now back to our discussion. How come a moderator can suspend a user without any proof of wrong doing? At the very least I would rate your account history as an interesting read, so this is a far cry from a case "without any proof of wrong doing." Is it because BoltClock just lack of experience or young age is the factor for his mistake? I doubt it. After reading your reply BoltClock asked another moderator to double check his decision. An immature person might have just ignored your response, or tried to bury it. That clearly didn't happen here, since BoltClock asked other moderators for a second opinion. What is the lesson for this mistake? Do we need to introduce minimum age requirement for any future moderator on SE network? When we elect moderators we look at their contributions to the site. We can all decide based on their actions and writing whether or not we think they're mature enough to handle the responsibility. The community can make that decision without taking age into account. People can lie about their age on their profile. You don't really know how old anyone is on here. Every moderator is prone to mistakes, young or old. Everyone is also capable of maturity, teenage or adult. I do not believe that age is a factor that should be considered for a moderator. Note that revealing age isn't even required on the sites, so this really isn't even an enforceable metric to require of moderators. Moderators are required to sign a simple EULA which requires affirming the Terms of Service which requires the person to be of at least 13 years of age. Past that, we're good. There are only two ways to be a moderator - you have to be handpicked by the Team, or you have to be elected by the community. This isn't a job that just anyone can get - people get this job through the merits of their contributions and activity on the site. We've both appointed and elected young moderators across the entire network, and they've proven to be as responsible and capable as the adult moderators, sometimes even shining above their older compatriots on the same sites. So, no, I don't think we should implement an age requirement, because we'd lose a number of very good moderators for reasons completely unrelated to their own ability to help us succeed as a network. Following your logic, we should probably screen all questions on meta from users with purple fractal gravatars because you have a purple gravatar and 100% of your meta questions have more than 20 downvotes! Both your answers have negative scores, too. The correlation is FOUR TIMES AS STRONG as that between the young moderator and making mistakes since it's happened four times as often, and with 100% consistency. I really doubt that the reason for the mistake is that he was a teen. While most teens act immature, the mature ones have pretty much the same level of maturity as other adults, in my experience. You usually can't even tell the difference... A teen who's been elected a mod most certainly falls under this "mature" category, and wouldn't be any different from the other mods. People make mistakes. So do mods. Note that the vote-detection system is internal, and mods can only see certain patterns. They cannot see who you voted against, just something or the other indicating "unusual voting patterns detected" (I'm not a mod so I don't know exactly what they see). In this case, I believe that the mod under scrutiny just saw the flag and maybe made a mistake in interpreting it/hit the button too quickly. Also, BoltClock is 20 and I doubt that the concept of teenage immaturity, however flawed, even applies to him. I've noticed a ton of other very high-rep SO users that are much younger than I am, and that would likely make much better mods than me. Age is not what makes one a good moderator. As a metric, age is likely to have some correlation with one's skill at moderating a community, but the correlation is definitely NOT a uniform correlation because at various ages, one's ability will be different. Much more important is how the community sees the moderator in question. If the community feels that the moderator is fair, just, a good leader, wields his/her power responsibly, and makes the community better, then the moderator is doing a good job. These "measuring sticks" are very much the same ones used in most governments around the world where leaders are elected by the citizens and, in general, it has proven to work pretty well, which is why moderators for the SE network are elected, and not just appointed. Raising the concern is valid, and it is always good to have a discussion, but in this case, I don't believe you have much of a leg to stand on when it comes to supporting your argument that age is a factor in moderation ability. If anything, time matters much more. Not the answer you're looking for? Browse other questions tagged discussion moderation account-suspension . What to do to boost your chances of becoming an SO moderator? Did I go wrong flagging this sarcastic answer? If so, where? Is there a way to see the moderator agreement if you are not a moderator? How do I see all newest questions (even negatively voted ones) with the new navigation? Is there a council of the elders? Should Community Moderators be “elected for life”, or have terms? Would allowing moderators to update their Stack Exchange sites' Twitter accounts improve visibility and offer more value? Are Stack Overflow mods spending enough time evaluating each flag?